Using ten scary Halloween things readers count from one to ten and then back down again. Each page has illustrations that sequentially correspond to a number, featuring bats, ghosts, skeletons and other Halloween symbols. 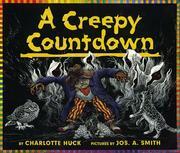 Huck, Charlotte, “A creepy countdown,” Children's Picture Book Database at Miami University, accessed April 25, 2019, https://dlp.lib.miamioh.edu/picturebook/items/show/9743.